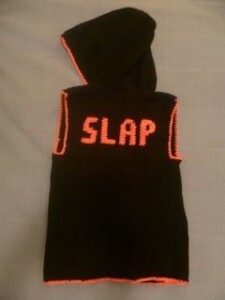 This hoodie is designed for warming up at roller derby training. It can get quite cold sometimes skating around in a sports hall at night in winter. But it is hard to wear a jacket because the sleeves won’t go over your elbow pads and the hood won’t fit over your helmet. 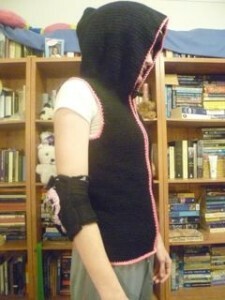 Well this hoodie has no sleeves and has a massive hood that can cover your helmet. 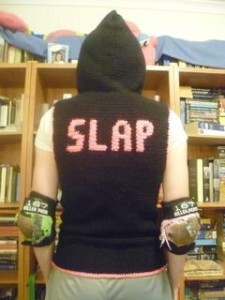 There is also an option to personalise it by crocheting your name and/or number on the back. Join the wool to the outside edge on the other side and repeat the instructions for the first front panel (you will make a mirror image of the first front panel). Join the wool 10 stitches away from the edge of a front panel. 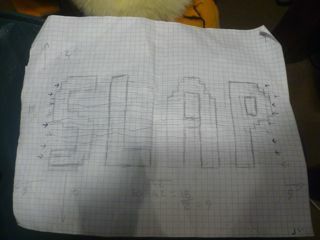 As the back is 60 stitches wide and 50 stitches tall you can design a tapestry crochet that fits in that space. Fold the hoodie so the front panels are lying against the back and sew up the shoulders. You should now basically have a vest. 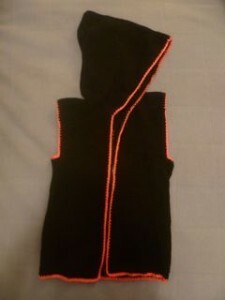 The hood is made in two pieces. They are basically just rectangles with a curve instead of one of the corners. 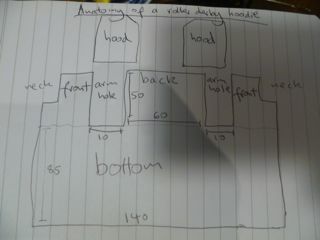 Row 1: Fold the hoodie in half down the middle of the back so that one side is facing you. Join the wool to the neck and work two sc in each stitch from the edge of the collar to the middle of the back. In my case this was 64 stitches. Row 70: (decrease two stitches together) x 2, sc in the next 51 stitches (53 stitches). Excellent work, now make another one. Sew the two pieces of the hood together. 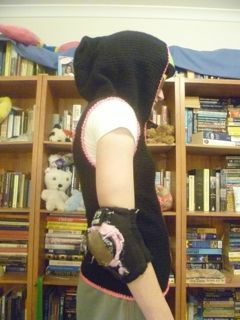 Attach the wool in a corner of the bottom panel and sc all around the hoodie including the hood. This neatens everything up and can add visual interest if you use a contrasting colour (such as pink). Buy a zip (I needed a 50 cm one). Make sure it is an open-ended, not a close-ended zip (I made that mistake). Sew it on. Chain stitch until you have a chain long enough to form a loose ring around your hips. Sc rows until the fabric reaches from your hip to a bit below your armpit. Wrap the bottom around your body so that it joins at the front. Put a marker near the front of your armpit. The area between the outside edge and this marker will be a front panel. Sc rows between the marker and the outside edge until you reach your collarbone. Then decrease on the very outside edge to form the shape you want for your neck. Be careful to decrease enough so that there is actually space for your neck. Then just keep making sc rows until you reach the top of your shoulder. Repeat the mirror image on the other side. I think this should be about the same for everyone but play around with the height so that it is not too massive or too small for your helmet.